In a ten-day period in 1983, the Colorado Quartet made history by winning two of the music world’s highest honors: the Naumburg Chamber Music Award and First Prize at the Banff International String Quartet Competition. Since that time it has been praised on four continents as one of the finest quartets of our time, cited for its musical integrity, impassioned playing and lyrical finesse. Currently based in the New York City area, the Colorado quartet appears regularly in major halls around the globe. Highlights of their career include tours of more than twenty countries, New York concerts in Carnegie Hall and on the Great Performers at Lincoln Center series, appearances at Washington DC’s Kennedy Center and at the Concertgebouw in Amsterdam, and performances at festivals in Scandinavia, the Czech Republic, and at the Casals Festival in Puerto Rico. The Colorado Quartet celebrated the 1995 Béla Bartók centennial with the first complete performance of the Bartók String Quartets to take place in Philadelphia. The Quartet memmbers have been featured on radio and television worldwide, with numerous radio broadcasts in America, England and Canada, as well as television programs in The Netherlands, Norway, Puerto Rico, Peru and Mexico, Their recordings include works by Mozart, Beethoven, Brahms and contemporary composers on CD’s from Fidelio, Albany Records and Parnassus Records. The members of the Colorado Quartet are inspiring teachers, who have held residencies at Swarthmore and Skidmore Colleges, Philadelphia’s New School of Music, Bard College and Amhesrt College in Massachusetts. They are founders and Artistic Directors of the Soundfest Chamber Music Festival and Institute of String Quartets in Falmouth, Massachusetts. I had already accepted this disc for review (eagerly–if the world were going down and I could save only two composers, they would be Lassus and Brahms) when El Jefe Flegler added: “Parnassus is the label run by our own Leslie Gerber” That gave me pause for thought: what if the disc wasn’t very good, the playing poor, the notes sloppy, the sound inadequate? The first responsibility of any critic is to his readers, of course, so how–if the worst came to the worst–was I going to avoid stabbing a colleague in the front? In the event, my problem is indeed something of that nature–but precisely the other way around. This disc is so good that it might be difficult to persuade you, dear readers, that the rave review you are about to be offered is not an example of confraternal complicity. When 1 tell you that the notes are by Bernard Jacobson, another Fanfare colleague and an old pal from our days in London, and that the design and layout are by ex-Fanfare writer John Wiser, you will be highly suspicious, and justifiably so: read this review with, not a pinch, but a handful of salt. But rave I must: this is quite simply one of the best discs of chamber music to come my way in a long, long time. So what is it about the performances that make them so special? A phrase from Hans Keller, writing about Franz Schmidt’s playing in the Schubert C-Major Quintet, comes to mind: “the imagination he pumped into the notorious second-cello passages in the slow movement had to be heard to be believed.” And that is exactly what you hear in these performances: four musicians of the highest caliber thinking deeply about what they are doing, listening, reacting to one another, giving and taking -these are living, breathing performances. The old cliche about the string quartet being four individuals in discussion comes to glorious life here: you can listen to any one of the lines, follow it through its interaction with the others, jump ship from cello to viola, say–wherever you focus your ears, you can hear the sheer amount of considered passion being put into the playing. And the control of pitch is absolute: so many quartet recordings these days are vitiated by sloppy intonation, even in some fairly well-known ensembles. No such worries here: even in such tricky places as the explosive chordal sequence that opens the finale of the C-Minor work, the intonation is bang on. I do have a criticism, you’ll be relieved to read. 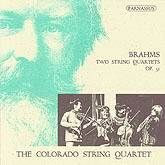 This is not big Brahms: the Colorados don’t play him with the powerful, broad bowstrokes that would have made these performances colossal. Instead, it’s rather more delicate, more sensitive than that. This is, dare I say it, ladies’ Brahms-or, to convey more or less the same image but offending only a few million people, it’s French Brahms. Whatever the stylistic approach, though, what you hear on this disc is nothing less than exquisite quartet-playing. Ossa upon Pelion: the recorded sound is first-rate, and Bemard Jacobson’s notes are masterly– they combine insight and understanding within a wide frame of reference (he knows his Brahms, this man) with an easy style that makes the technical accessible, even obvious, now that he draws your attention to it. I learned a good deal from his essay. It gladdened my heart, this disc. So many of the quarter recordings I get sent for review disap point (usually, as I say, because poor intonation from one of the players–often the first violin, sur prisingly enough-scupper the entire project at the outside). This one disappointed no whit. I have played it again and again since it arrived, and every time it sets my musical adrenaline coursing. Do yourself a favor and buy it. Leslie Gerber isn’t going to be short of ideas to keep the Colorado players busy, but let me chuck one at him anyway. Their playing of the Brahms A-Minor Quartet reminded me of how much Franz Schmidt learned from Brahms in his own two quarters–and we could certainly do with a good modern recording of those two works. The only recent recording I know of them–by the Franz Schubert Quartett, Wien, on Nimbus NI 5467–is exactly one of those discs where inaccurate intonation mars the product from the outset, though here the players also misjudge the music. Ilthe Colorados did to Schmidt what they have just done to Brahms, Parnassus would walk straight into a thousand Want Lists. What I like most about this recording, besides the immaculate intonation (rare in performances of these pieces) and extremely precise rhythm (the music is loaded with duplets against triplets), is the fact that the recording favors the inner voices. The quartet plays the music from tile inside out, building on a very strong center of second violin and viola. Parnassus has recorded them so that as listeners we get a view from the inside where we can observe the crystalline formations of the music like a stargazer looking at the sky on a very clear night These four people play with such a like mind that it is easy to imagine that they could he playing irnstruments made by the same maker, of wood from the same tree. The Colorado Quartet, whose members come mostly from California, had its beginnings at the University of Colorado at Boulder and is now based in New York. They have had an impressive international reputation for many years and have won many awards, including the Naumburg Chamber Music Award and First Prize at the Banff International String Quartet Competition, both in 1983. From this recording it is clear why. For a real treat, listen with the score!